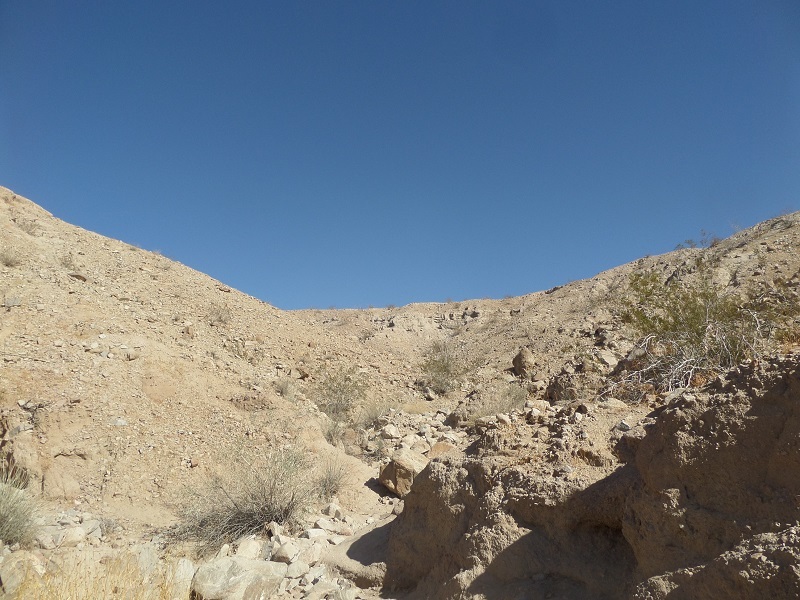 Location: Mecca Hills Wilderness Area southeast of Palm Springs. From I-10 in Indio, take Highway 86 southeast for 10 miles to 62nd Ave. Bear left onto 62nd Ave. and head east for 2.2 miles to Johnson St. Turn right and go 2 miles to 66th Ave. Turn left and follow 66th Ave. for 4 miles (it becomes Box Canyon Road) to Painted Canyon Road. Turn left and follow Painted Canyon Road 4.7 miles to its ending. Painted Canyon Road is dirt but is usually in good shape and should be passable by most vehicles if there have not been recent rains. From the east, take I-10 to the Cottonwood Springs Road exit (168) and turn left onto Cottonwood Springs Road. In 0.5 mile bear right to continue onto Box Canyon Road. Follow Box Canyon Road for 14.5 miles to Painted Canyon Road. Turn right and follow Painted Canyon Road to its ending. 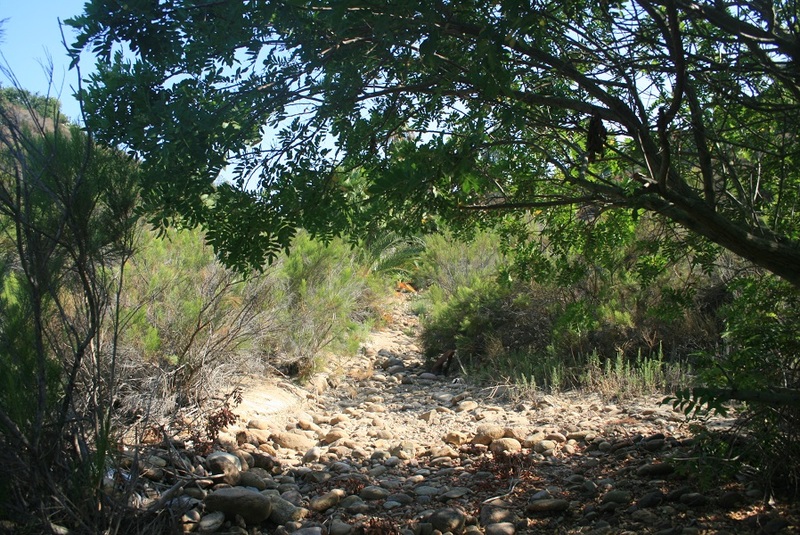 NOTE: Box Canyon Road is subject to closure if there have been recent rains. Check conditions before going. Camping/backpacking: Camping allowed up to 14 days. 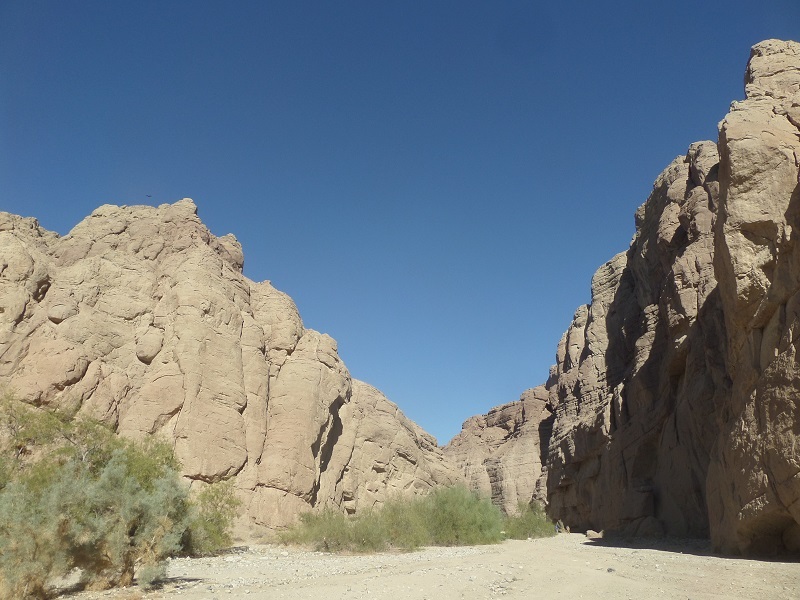 For information about camping in the Mecca Hills area, click here. 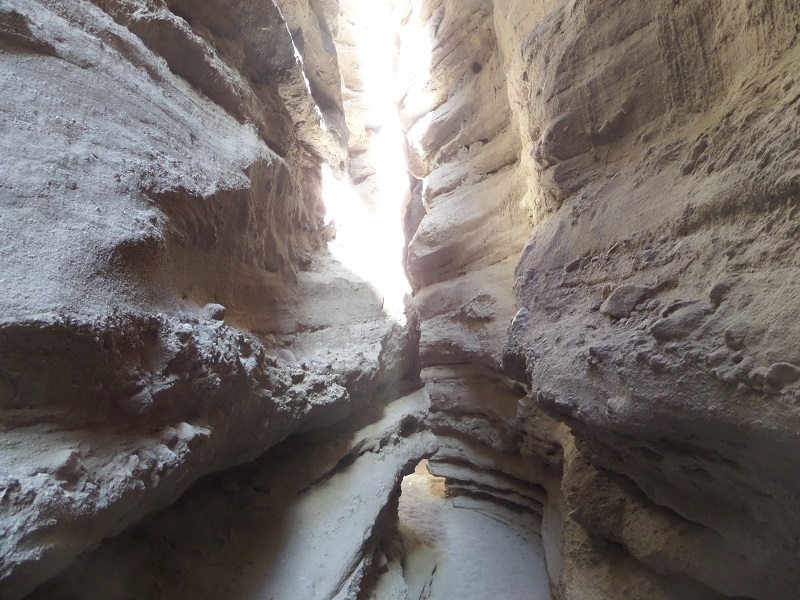 This truly amazing hike explores two slot canyons in the badlands east of the desert town of Mecca. With panoramic desert and mountain views, narrow passages, caves, unusual geology and a surprisingly diverse range of plant life, this loop provides as much eye candy per mile as you are likely to find anywhere in So Cal. Though it’s popularity is understandable and you’re likely to have company on the weekends, it’s less crowded than Joshua Tree and the scenery matches up to the best that the more famous park has to offer. 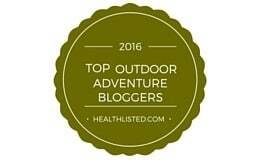 Besides the normal caveats of hiking in the desert, there a few points to consider before deciding to do this hike. 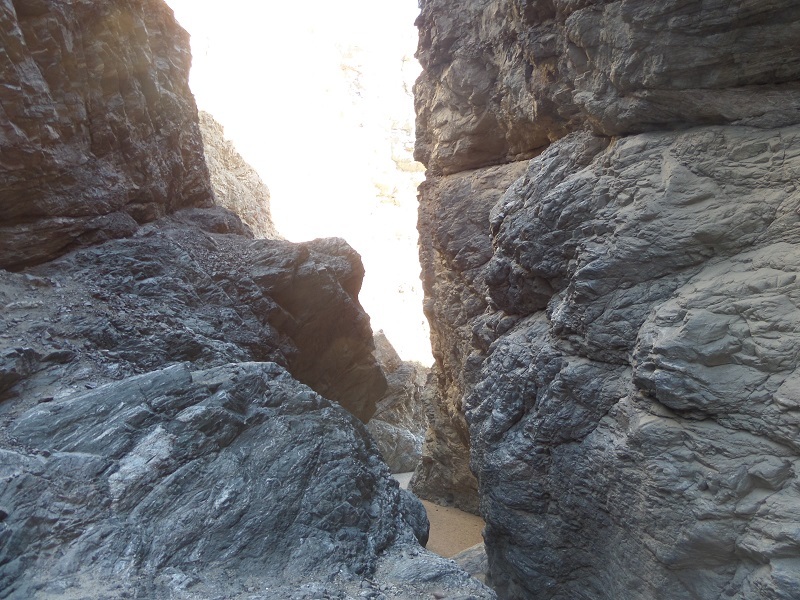 As with any slot canyons, avoid during rain due to the chance of flash flooding (also check to see if Box Canyon Road is open before coming as it is often closed following rains.) Also, keep in mind that while the ladders that give Ladder Canyon its name are maintained by dedicated volunteers, there is no guarantee that they will be in safe working order. If you are uncomfortable climbing up and down ladders, make sure you hike with others. 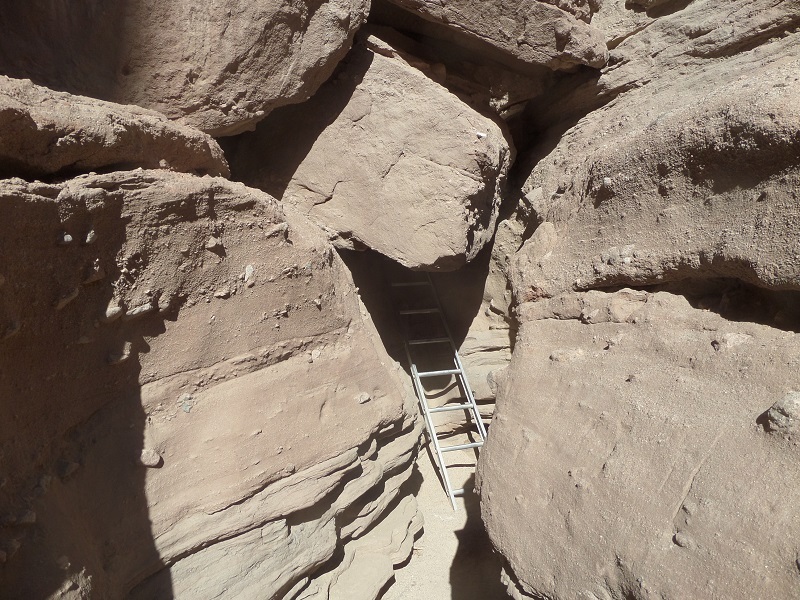 (It is possible to enjoy a two mile round trip hike up the sandy wash of Big Painted Canyon without using any of the ladders.) 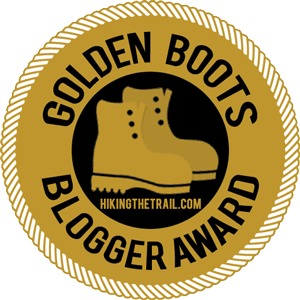 There are a few spots where the route is a little ambiguous, but many trail ducks and footprints of other hikers will help you find the way. Often times as you make your way up Ladder Canyon, routes that separate will soon converge. From the parking area, head northeast into Big Painted Canyon. The walls tower some hundred feet above, looking as if they could have come from a Star Wars movie. After half a mile of easy walking, you reach the mouth of Ladder Canyon on the left. By hiking clockwise, you will ascend four ladders and only have to descend two. 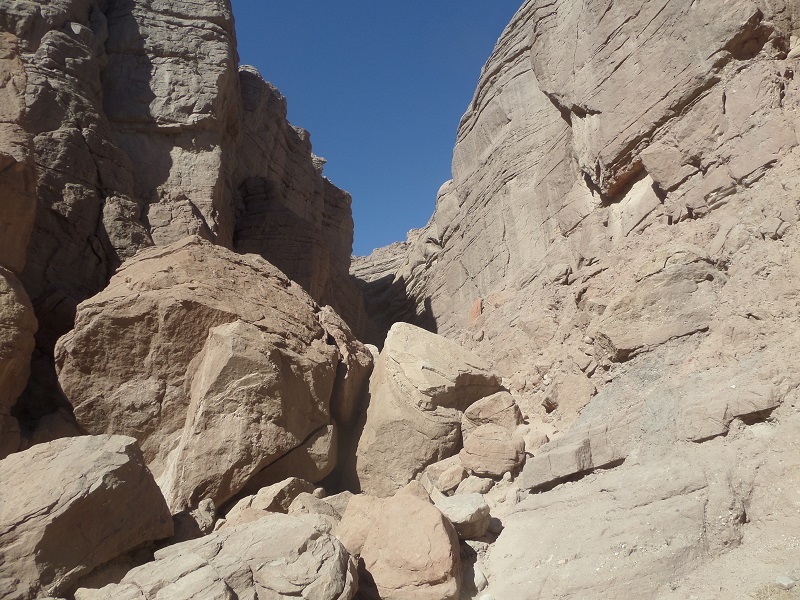 Scramble up into Ladder Canyon and briefly drop to its sandy floor before reaching the first ladder, on your right. The ladder climbs under a wedged boulder before bringing you to a narrow slot which will require some shimmying. 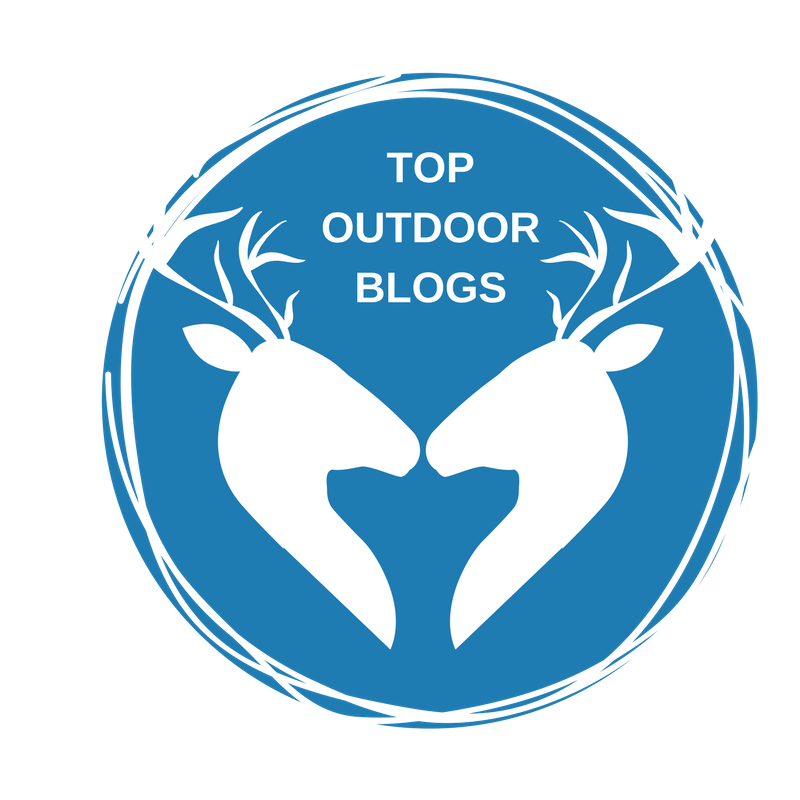 The next ladder is taller, bringing you to another level of the canyon. Soon the walls widen out and you head up the wash toward a ridge to the north. 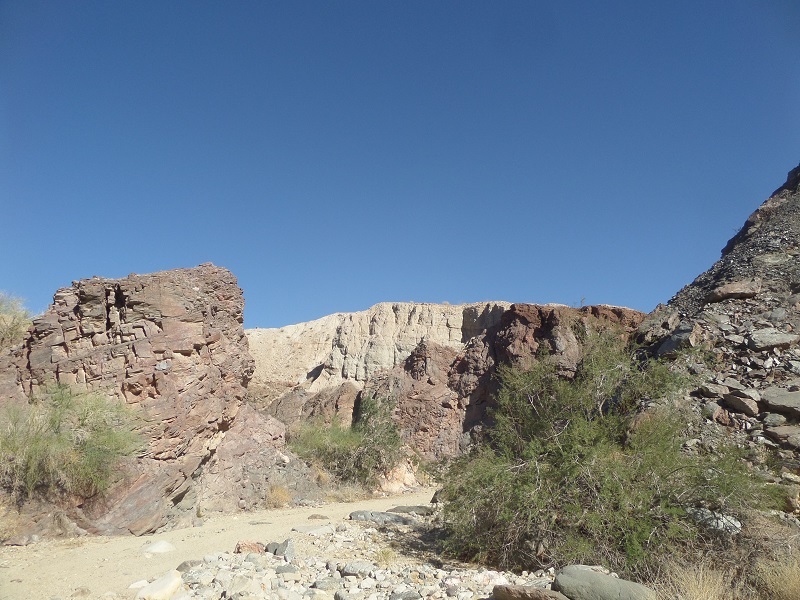 There are a few use trails, including a questionable looking ladder, that climb up the right side of the canyon, but the simplest route is to follow the wash, which requires a little scrambling in spots but nothing too difficult. At the bottom, head south (right) down Big Painted Canyon. 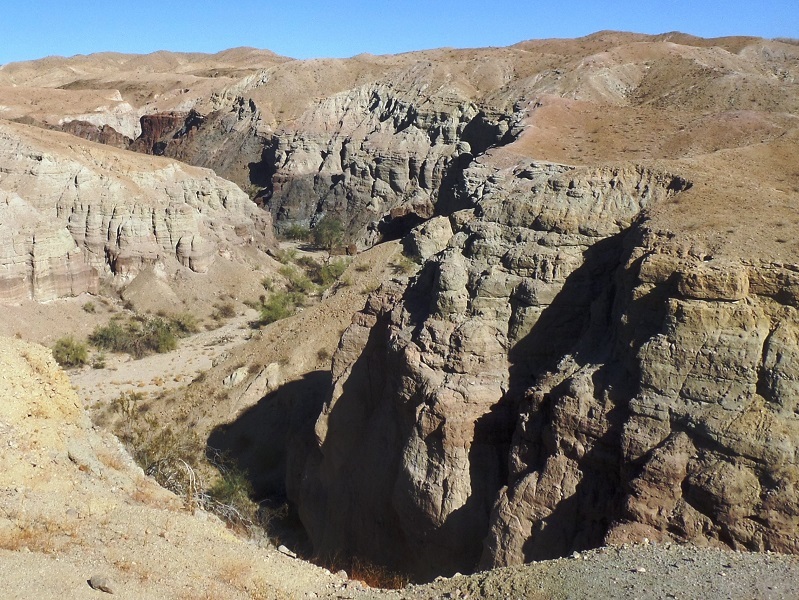 The canyon’s name, predictably, comes from the wide range of colors of the rocks – nearly white to deep brown – “painted” by millennia of sediment. Desert willows, palo verde and mesquite are among the plants that grow in the wash. A few side-canyons can be explored by adventurous hikers. After about a mile, you reach the final two ladders. Turn around so you can descend facing the ladder itself (easier said than done.) After the second ladder, enjoy an easy half mile walk back to the junction and from there, retrace your steps to the parking area.